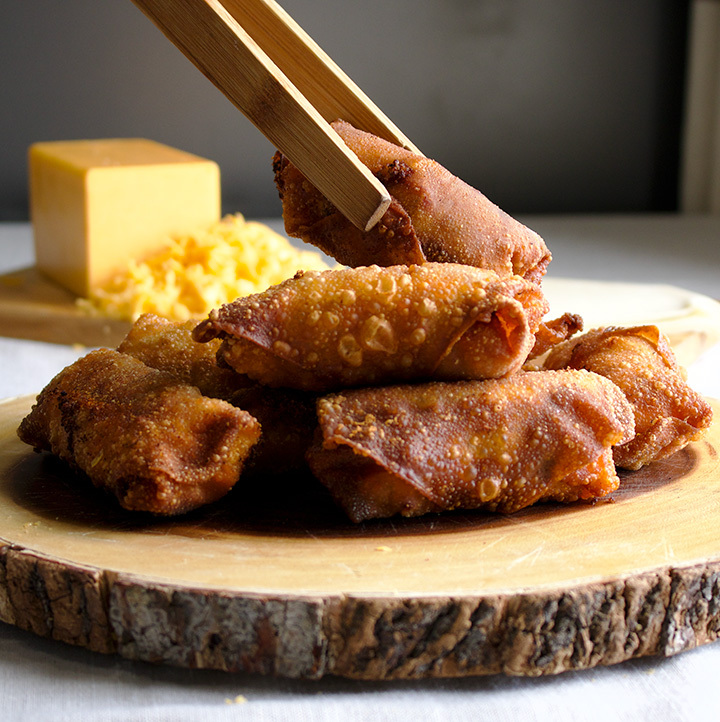 Saucy Sloppy Joe Egg Rolls with Cheese. 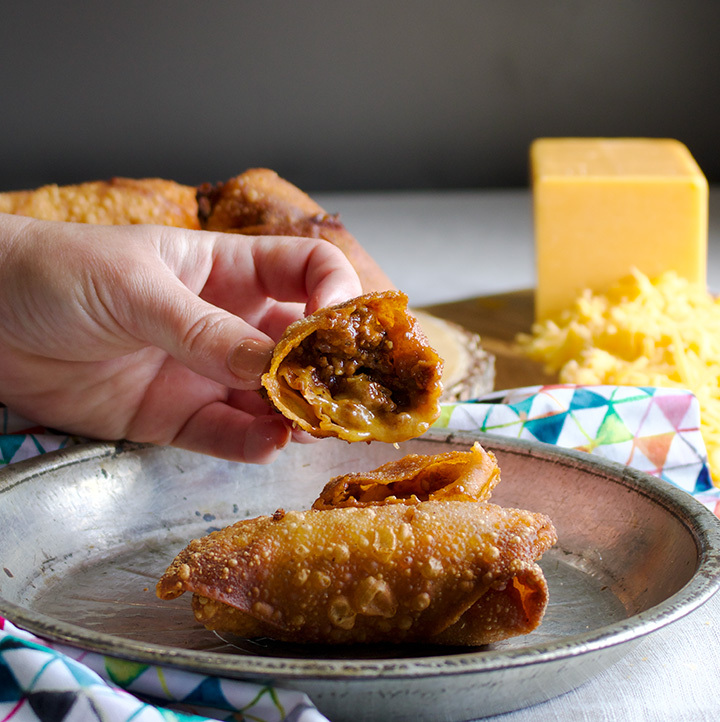 These simple, tasty little egg rolls contain a deliciously saucy beef sloppy Joe filling and plenty of sharp cheddar cheese. 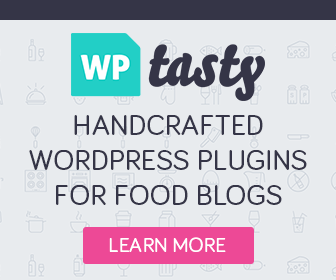 If you have kids, this is one of those recipes you might initially make for them and then every time after that, say they’re for the kids even though they’re actually for you. Saucy hamburger and cheese in a crispy fried shell. Kids will love them. Of course they will. But, what might surprise you is how much you like them. When I told my family I was making Sloppy Joe Egg Rolls they looked a bit skeptical. They’re going to be really good, I said. We trust you, they said. But, they didn’t look very trusting. Undaunted, I charged forward. I sprinkled steak seasoning and onion powder on some ground beef and let it simmer in tomato sauce with a bit of brown sugar, Worcestershire, and mustard tossed in for good measure. The house smelled delicious in about 5 minutes. 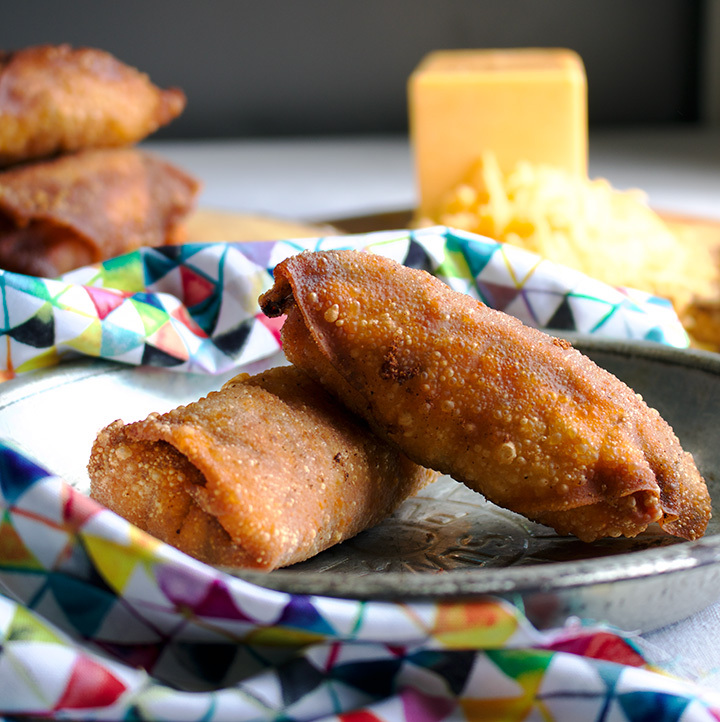 Then I simply wrapped it into egg roll wrappers with plenty of cheese and fried them up. By the end of the day, all 12 Sloppy Joe Egg Rolls were gone, and the next day, everyone complained that there weren’t any more. So, let that be a lesson to you. If you’re making these for a party for which there will be other snacks, one per guest will be plenty. If you’re making these as a meal for a family of four, 12 will be more than enough to fill everyone up. But, if you want a few leftover for lunch or snacks later in the week, I’d suggest doubling the recipe. As an aside, these egg rolls spurred a debate about whether they should be called Sloppy Joe Egg Rolls or Cheeseburger Egg Rolls. I wanted to go with Cheeseburger, because you don’t generally add cheese to a Sloppy Joe, do you? My girls disagreed, feeling that Sloppy Joe was a better descriptor of the filling’s flavor and texture. As you can see, they won out, even though I added “cheesy” to the title just to keep us honest. you’re oil is too hot, the egg roll wrappers will burn. 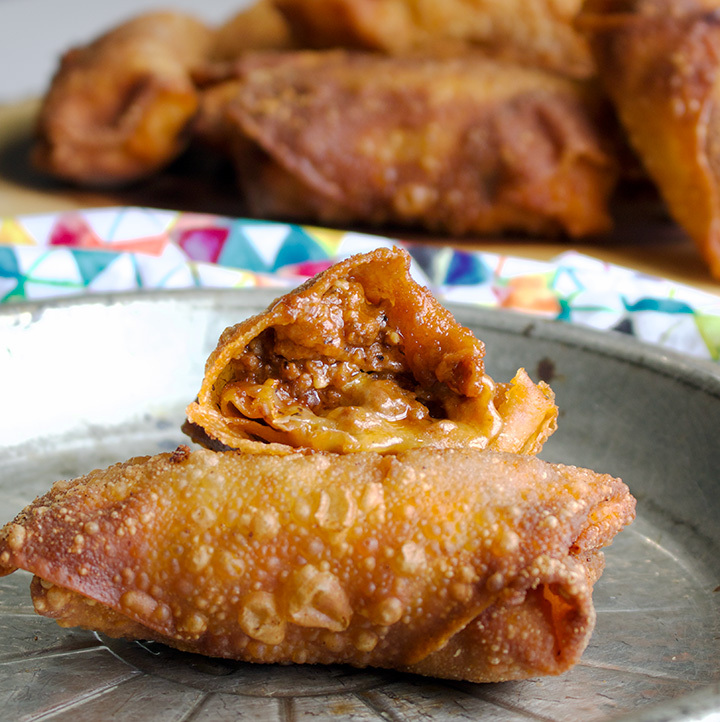 If it’s too cool, the egg roll wrappers will absorb too much of the oil while the cook, resulting in greasy egg rolls. 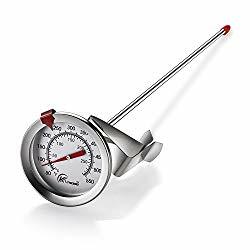 Do your best to keep the temperature of the oil between 325 and 340 degrees when frying; a thermometer will make that much easier. 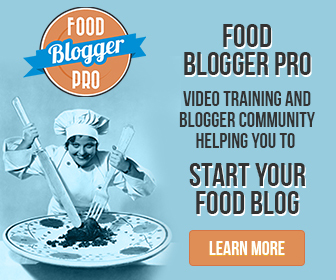 Heat the oil in a large heavy bottom saucepan over medium heat until shimmering. Add the ground beef, steak seasoning, onion powder, salt, pepper, and minced garlic. Stir to combine and cook until the ground beef is browned, about 2 minutes. Add the tomato sauce, ketchup, brown sugar, Worcestershire, mustard, and hot sauce (if using) to the pan and stir to mix. Bring to a boil, then turn the heat down slightly and let simmer for about 5 minutes, stirring frequently. Taste and add more salt, pepper, or hot sauce if desired. Pour the sloppy Joe mixture into a bowl and let sit for 10-15 minutes to allow it to cool slightly. Get a work surface set up to assemble the egg rolls: Line a baking sheet with parchment paper and set close by. Fill a small bowl with water. 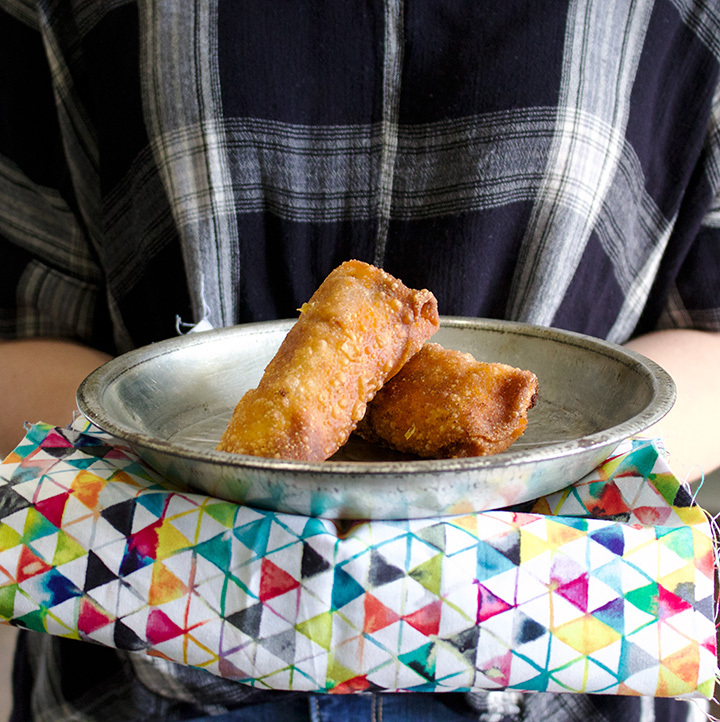 Unwrap the egg rolls from their packaging and cover with a damp paper towel. Place the grated cheese and sloppy Joe mixture next to the egg roll wrappers. Working with one at a time, lay an egg roll wrapper in front of you. Dip your fingers in the water and brush it along all 4 edges of the egg roll wrapper to dampen. Spoon 2 generous tablespoons of sloppy Joe mixture in the center. Sprinkle about 2 generous tablespoons of cheese over the meat. Fold the bottom corner of the egg roll wrapper up over the filling towards the center. Fold the left side corner up and over the bottom corner and the meat and cheese mixture. Fold the top corner down to the center, then roll the egg roll towards the right corner. Press the seam with your fingers to seal and lay the egg roll on the parchment lined baking sheet. Repeat with the remaining egg roll wrappers and filling. Fill a large saucepan with enough oil to come up the sides of the pan about 2 inches and set it over high heat. Heat the oil to 325 degrees. Line a baking sheet with paper towels and set it close by. Using metal tongs, add 3 or 4 egg rolls to the hot oil. As they fry, turn them so that they brown on all sides. When the egg rolls are a deep golden brown, use the tongs to remove them from the pan and lay them out on the paper towel lined baking sheet. Repeat with the remaining egg rolls, watching the heat and adjusting the temperature of the burner to keep the oil between 325 and 340 degrees.